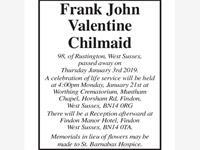 Frank John Valentine Chilmaid, 98, of Rustington, West Sussex, passed away on Thursday January 3rd 2019. 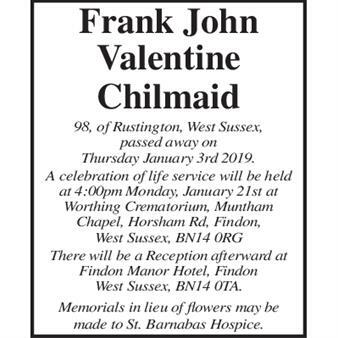 A celebration of life service will be held at 4:00pm Monday, January 21st at Worthing Crematorium, Muntham Chapel, Horsham Rd, Findon, West Sussex, BN14 0RG There will be a Reception afterward at Findon Manor Hotel, Findon West Sussex, BN14 0TA. Memorials in lieu of flowers may be made to St. Barnabas Hospice.